The Dynasty reigning in the Lower Egypt at Tanis. As it seems this dynasty was more legitimate than the dynasty of high-priests of Amon founded by Herhor ruling in the South. Most reliable dating of the Dynasty as well as the whole III Intermediate Period seems to be that proposed by Kenneth Kitchen. To view the transcription of kings titulary properly, please download and install transliteration font. It is difficult to say firmly if Smendes was king of the Delta yet during the reign of Ramesses XI or, holding at that time a post of vizier, proclaimed himself king after Ramesses’ death. Presumably he was son of Herhor and Nedjemet and became Ramesses XI son-in-law by marriage with Tentamen. Story of travels of Wenamen mentions Smendes in context suggesting that he was actual ruler of Egypt. His 26 years long rule, as assigned by Manetho, is also corroborated by archaeological data, especially “Stele of expelled” ascribed to Smendes. It is assumed that Smendes ruled for some time over the whole Egypt until the reign at Thebes was overtaken by high priests of Amun. Presumably son of Smendes and Tentamon, elder brother of Psusennes I. In genealogy of priesthood of Memphis he is mentioned before Psusennes while Manetho, ascribing to him 4 years of rule, placed him after Psusennes. Most likely at the end of his short reign he made Psusennes co-regent. He was about sixty-six years old when he died. Son of Pinedjem I and Henuttaui. It is possible that for some time he ruled alongside with preceding him Amenemose as his co-regent. Facts concerning external politics of this ruler are very santy, possibly he kept trade contacts with Assiria, as proved by cuneiform inscription in jewellery found in his tomb. His burial place is a tomb 3, discovered at Tanis in 1939-40 by P. Montet. This tomb, built for Psusennes I, his wife Mutnedjemet and son of Ramesses – Ankhefenmut, although intact by tomb robbers, later was used for burial of Amenemipet, Sheshonq II and chief priest of all gods Wendjebwaendjed. Outer sarcophagus of Psusennes made of pink granite, belonged primarily to Merenptah. There was second sarcophagus of black granite enclosed inside it, holding in turn a coffin of solid silver. P. Montet found many treasures in this grave, including gold funerary mask, gold and silver pottery and jewellery. Unfortunately the mummy fell completely into pieces. Son of Psusennes I and Mutnedjemet, high priest of Amun at Tanis. Presumably Amenemopet was the father of Osokhor and Siamon. He helped a prince Hadad of Edom, who took refuge to Egypt. He was building at Giza (Chapel of Isis) and Memphis (Temple of Ptah). Burial place – tomb IV, rather small chamber at the royal necropolis at Tanis. Subsequently, in times of Siamon his mummy was moved to a chamber in the tomb of Psusennes I, which was primarily intended for his mother Mutnedjemet. April 16, 1940 P. Montet discovered the tomb and found there various pieces gold and silver equipment. Son of Sheshonq, the “Great chieftain of Libyans Meshwesh” by Mekhtenusekhet. Manetho ascribes to him six years of rule and a name of Osokhor which is a Libyan form of Egyptian wsrkn - Osorkon. If these assumptions were correct, Osokhor should be placed in Libyan dynasty XXII as Osorkon I and thus numeration of succeeding him pharaohs of the same name should also be changed. In another opinion Osokhor was son and successor of Amenemipet and thus should be ascribed to dynasty XXI. Origin of Siamun is not clear. It is believed that he might have been brother or son of his predecessor Osokhor. Building activities of Siamun is worth mentioning. 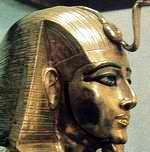 He extended temple of Amun at Tanis, at Memphis he erected temple also in honor of this god. There are also many in situ relics preserved with name of this king. He made war campaign against Philistines residing in Palestine and captured city of Gezer became a dowry of Siamun’s daughter married to Salomon, which certainly consolidated alliance between Egypt and Israel. Historians face great problems while trying to identify this ruler. There is opinion, shared by J. Beckerath, that Psusennes II and Psusennes III, the high priest of Amun at Thebes, were one and the same person. It is possible that Psusennes II was local ruler at the Abydos area and held his rule briefly in times of Sheshonq I, however in this case the theory of his reign lasting 14 years until the end of XXI dynasty is out of question. 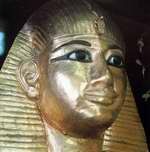 One of Psusennes II daughters, Tenetsepeh, was wife of Shedsunefertum, the high priest of Ptah at Memphis. The second one, Maatkare, was married to Osorkon I.